← Customer Service in Simulation – Exactly Who are the Customers? Simulation can be utilized in a manner that is consistent with the current recognition of the gains and benefits of “The Flipped Classroom”. Essentially the flipped classroom that many educators are talking so much about is an engagement of the students that is different than traditional models. Historically learner show up to lectures to learn about a new topic and then are assigned homework to reinforce the concepts. In the model of the flipped classroom, the students are provided with tools such as lectures, video examples, resources, reading lists that introduce the topic and allow a cognitive exploration BEFORE coming to class. Then they show up to the face-to-face activity and instead of hearing a lecture from the professor are engaged in higher levels of cognitive processing regarding the topic. These higher levels could be conducting experiments, experiential learning, exploration, group discussions debating a topic, or perhaps engaging in scholarly debate on the merits. Imagine education surrounding a topic that involves pre-learning such as web-based education, video reviews, or other activities that either introduce a new topic or perhaps refresh the cognitive underpinnings of the subject matter. Then have the learners come together in a face-to-face environment and engage in experiential learning through simulation of various sorts that may include mannequin based simulation, partial task training workshops or content review discussions. It seems like the ultimate combination. 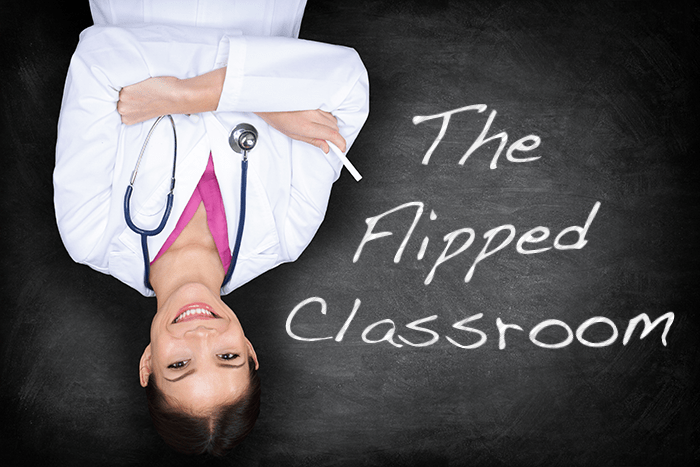 Interestingly, as I have been reading more about the Flipped Classroom I realize that we have been utilizing these concepts for many years in Simulation in particular with our programs aimed at training residents and practicing professionals. At my center (WISER) many of our courses are created with just that type of overall education strategy. Our Simulation Information Management System (SIMS) houses over 125 courses many which have extensive online materials for subject matter review prior to the actual simulation day. Subject materials may be pre-recorded lectures, PowerPoints, screen based simulations, videos demonstrating correct performance for example. Some courses even perform pre-tests before the actual simulation encounter to ensure that the cognitive preparation has been completed. Intuitively it is easy to understand the advantages. The face-to-face time that students spend together in conjunction with faculty members is generally the most expensive time of the education. So it seems that we should be creating activities that maximize the effectiveness of the precious face-to-face time. Now the technology is no longer a barrier for the dissemination of information we can appeal to various learner types and styles, as well as keep the face-to-face time for much higher-levels of engagement. Thinking about it from a Kirkpatrick model we can move the reaction and learning levels to a more efficient off-site, self-paced exploration and learning, and then maximize the time the face-to-face environment with faculty to achieve higher levels of knowledge acquisition and expertise such as behaviors and results. During the learning and reaction phases the learners can obtain the materials at their own pace and perhaps have a choice of methods by which to achieve the cognitive learning objectives. This increases the efficiency as learners who are mastering the material more quickly can move along to more advanced topics, and those who need a little more time, or need to review several times over have the ability to do so. During the face to face sessions simulations scenarios can provide a deeply immersive learning environment for learners, and then this can be augmented by rich interactive discussion with faculty members as well as peers as continual mastery of the materials are recognized. The experiential learning offered by simulation can help to demonstrate the student’s mastery of the material from a cognitive perspective as well as demonstrate the ability to apply to real-world or near real world settings and circumstances. This combination of cognitive priming or preparation with the experiential immersive process seems right to apply to the healthcare education environment. Recognizing that simulation, mannequin based simulation in particular, can be an expensive time-consuming endeavor; we need to ensure that we are maximizing the overall outcome of the educational experience. Thus I argue simulation can be the Model Flipped Classroom and provide significant return on investment for topics that are appropriately bundled in the fashion described. Paul, the only main challenge to the flipped classroom is that some students still show up to class without the knowledge expected. And as educators our instinct is to aid them in accessing that knowledge even when they didn’t read the book prior to class (or complete whichever learning activity assigned to them). We tend to fare better in the health sciences. But, the technology isn’t the barrier. Grit is. Yes! The challenge of flipping classrooms is that it puts a higher burden on the instructor to be prepared to engage in real time with the unknown challenging questions of the prepared students. Using simulation technologies and methods to collaborate with peers will help facilitate this type of learning. In terms of cost benefit, it gets more value out of the intelligence and knowledge of the lecturer than having a lecturer basically deliver something that could have been published in advance. It also provides the benefit of students learning from each other in terms of working out different understandings of the material.